We here at the Co-op have been asked to work on many rather unusual vehicles so when we were contacted to renew this small piece of history I could not say “yes” fast enough. 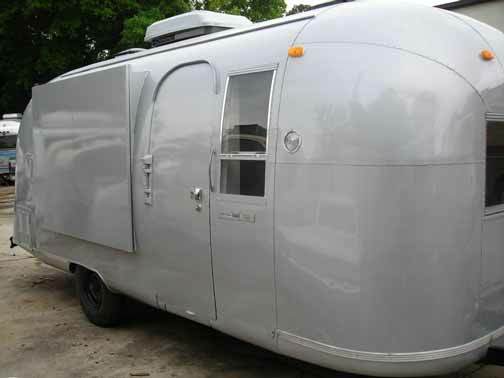 I have a soft spot for the early style :turtle shell” Airstream trailers– heck I have a 63 Tradewind myself so this little Safari really has my heart. 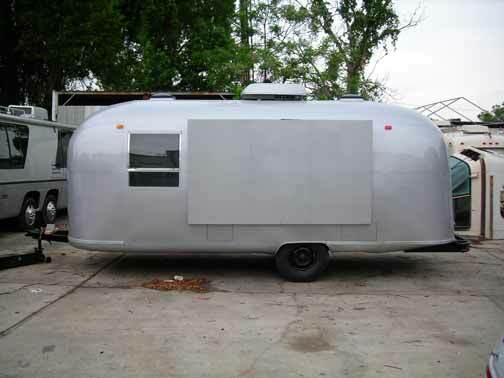 This is not a live in trailer, it was outfitted way back as a hot dog stand or something. It has 2 serving ports, one on each side so I imagine when operational it’s a pretty busy place in there. No utilities other than an old original roof AC, a couple of 110 outlets and some florescent lights, this beauty will again serve up goodies soon. First things first, we have to break it down to it’s “root mean”. The sheet goods floor must come out and the soft rotted parts of the floor exposed This must be repaired before the new antistatic rubber floor goes in. Meanwhile Barry removes the tires to get at the original bearings and sand blast the original “bud rims” for new paint Now that the blaster is up and running he goes after the years of surface rust on the tongue prepping it for its new finish. Out of paint now, soon this retro dog stand will be dispensing goodies again. Well not exactly, it will be used by the Hard Rock Cafe for what I have yet to divulge. Going for the “original” look, the unit was base/clear finished for a clean, easy to maintain finish. Next we will reassemble the exterior with new lighting then the interior gets the once over.